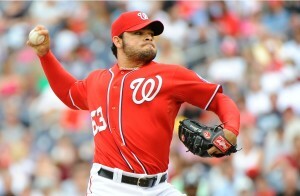 The Chicago Cubs acquired Washington Nationals reliever Henry Rodriguez in exchange for pitcher Ian Dickson on Tuesday. In 17 appearances this season, Rodriguez posted a 4.00 ERA and an alarming 11/16 strikeout to walk ratio in 18.0 innings of relief. Rodriguez was designated for assignment last week by the Nationals, but his 100 MPH fastball certainly attracted an interested Chicago club that has dealt with an inconsistent bullpen this season. In return, the Nationals received right-hander Ian Dickson, a 35th round draft pick in the 2011 MLB Amateur Draft by the Cubs. In 11 games with Low-A Kane County this season, Dickson has posted a 2-2 record and 6.88 ERA in 35.1 innings of work. Rodriguez will most likely serve as a middle inning reliever for the Cubs and may transition to a later inning role if he is able to pitch well by effectively commanding his fastball, which consistently sits in the high-90s and can reach triple-digits.